Keith Curle is well aware how close the Cobblers are to the Sky Bet League Two relegation zone - but insists that does not put any extra pressure on him or his players ahead of this weekend’s crunch clash with fellow strugglers Morecambe (ko 2pm). 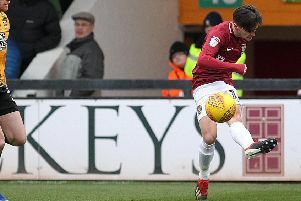 Last Saturday’s 3-2 defeat at Cambridge United, allied with another win for a revitalised Macclesfield Town, saw the Cobblers stay in 16th, but slide to within six points of the bottom two. Town have now won just two of their past 11 league games and claimed only 12 points out of the 33 available, and with 18 matches to play they are very much in a battle against dropping out of the Football League. But Curle insists there is no extra significance on Saturday’s date against the third-from-bottom Shrimps at the PTS Academy Stadium, regardless of their position. “I know where we are in the league,” said Curle, who took over from Dean Austin at the beginning of October with the Cobblers in 21st place and two points above the drop zone. “Make no mistake about it, when I first came in I knew where this football club was, but I am also very aware of where the football club wants to go and within that, there are certain things that need to happen. “We know where we are in the league, and we know that we need to be competitive in every game. And Curle added the only pressure he and the players are under is self imposed, and where the team is in the league table is irrelevant. “The pressure is about putting in performances and getting results, that is whether we are six points clear, level on points, or even if we are in the top six,” said the Town manager. “There are always three points available, and I don’t see it as pressure. “I see it as a challenge that the players have to face. “Every week the players have to put in performances that are worthy of their selection, and worthy of us getting three points. “The more people we have on board with that, then excellent, but there will be twists and turns. “There are going to be different highs and lows in every single game, but the focus of the players is on performance and results. “I like winning games and if I can’t win them, I like to draw them. “If we get beat then it is a disappointment that hurts me, but I use it as learning, and that is what we have to do - when we get beat we learn from it. A win over Morecambe this weekend would see the Cobblers move eight points clear of the Shrimps, who have won only one of their past 11 matches. But defeat would see Jim Bentley’s men close to within two points of the Cobblers.